In 1988 Gene and Nina Gennetten moved from Kansas City to the Lake after being weekenders for four years. They started a boat dock company with rental space in the basement of the Gravois Supermarket on Highway 5. Gene believed that if you built a good, strong dock and stood behind your work, you could make it. The first winter was scary, but in 1989 their son, Steve, moved here to help. In 1994, they built a new place on P Road. The rougher the Lake became, the greater the demand for stronger docks. They filled that demand. That year they also began building docks for the Missouri Department of Conservation, and went from six to 25 employees. They only service what they sell, but son Mike provides service for any dock. While working in 2006, Gene passed away. Nina and Steve now run the business and are thankful that Gene taught them well. They say their customers are the best and most have become friends! The Lake of the Ozarks offers a challenge to dock owners and dock builders with it’s rough water and recreational needs. 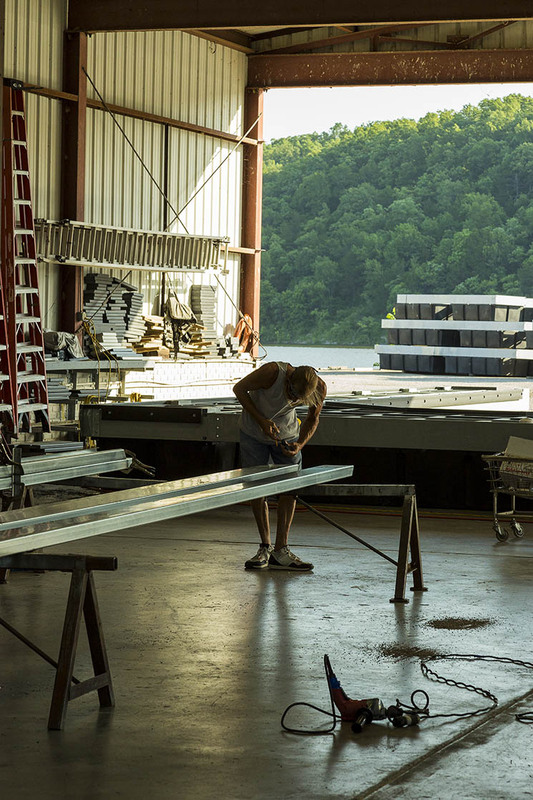 At Ozark Barge & Dock we build with integrity and strength to keep your dock secure even on the busiest of weekends.